This card and my goodie bags were done this morning and my post was supposed to go live after lunch, but between cleaning out pumpkins, making cupcakes for my daughter to take to cheer tonight and making dinner. It had to wait. I can't believe that this is my third Waltzingmouse Sketch Challenge. Times flies when you're having fun. This is also my last Halloween card for this year. I have never made as many Halloween cards as I did this year. 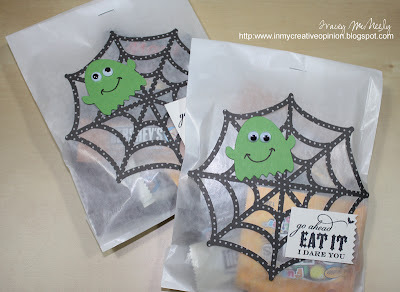 Primarily because of challenges but also because the images are just so darn cute not to mention that the colours that are associated with Halloween are fun too. 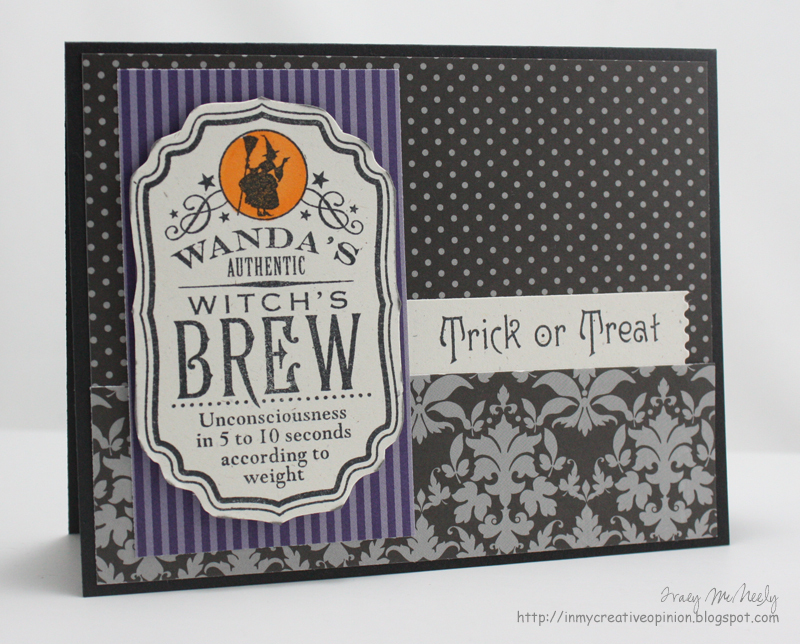 I know that I need to get the Spellbinder's Labels Four dies because Witch's Brew from Wanda's Pantry is just too hard for me to fussy cut. I paired this stamp (which is one of my favourite WM Halloween stamps) with some patterned papers and gave it to my husband. I got up this morning and finished the Halloween treat bags I made for my kids. My son is in charge of handing out candy now. He did a physed co-op at the elementary school behind our house last year so the kids love seeing their old gym teacher (it is quite cute really when they just point). My daughter had cheer tonight because the team is going to Cincinatti this weekend for their first competition and it didn't look like she was going to be able to go out with her friends. In the end she managed to squeeze in an hour--gee guess what she dressed up as? 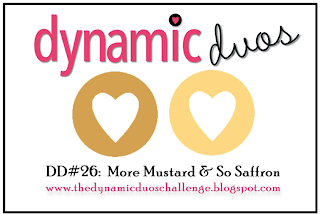 At the first looking at both this weeks Dynamics Duos colours and RetroSketches fabulous sketch by Jennifer Wills I was a bit concerned. 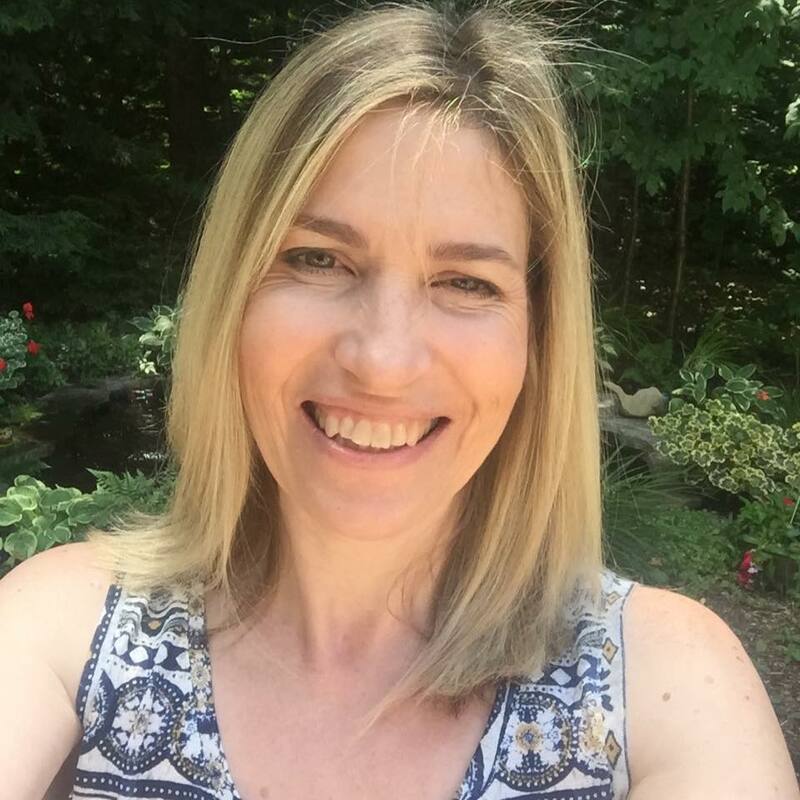 However, the whole idea behind blog challenges is to push up to reach beyond our comfort zone and try something new. Well I combined these two challenges together and came up with a card that I really LOVE. The colours came together and the unloved image pulled it all together. Last summer during Scrap-a-Faire I learned that buying a large roll of foam tape at the hardware store was much more economical that buying the smaller rolls at the craft store. The 36" roll at the craft store was $11.99 and the 350" roll at the hardware store was $12.98, big savings. 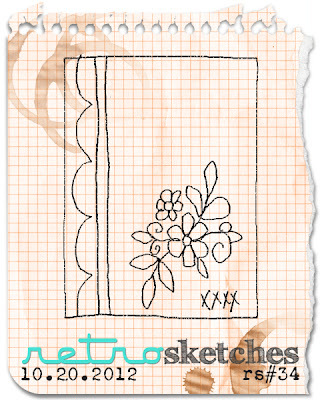 In the nick of time for this week's CAS(E) this Sketch Challenge #3. 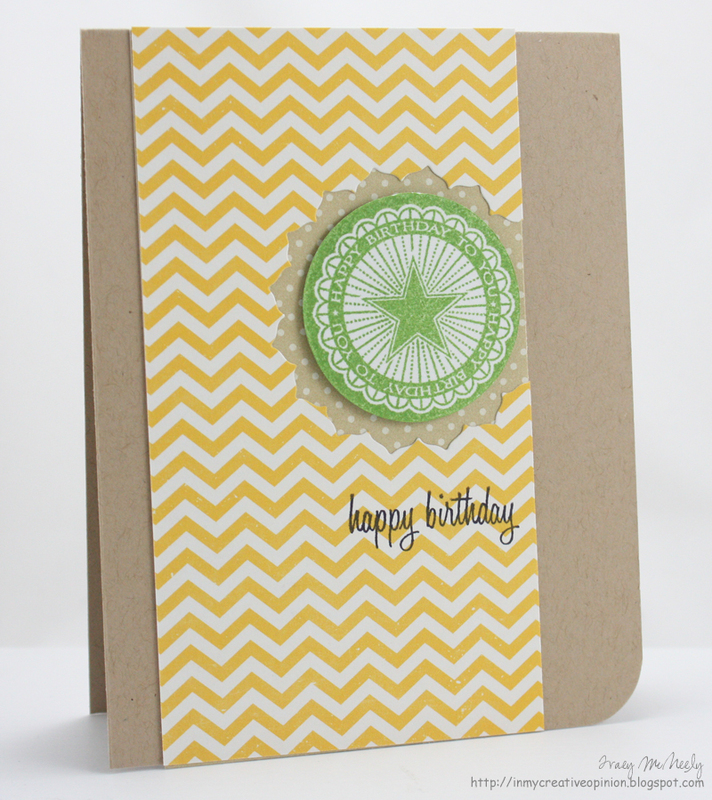 I know that everyone finds creating cards for men to be a big challenge. 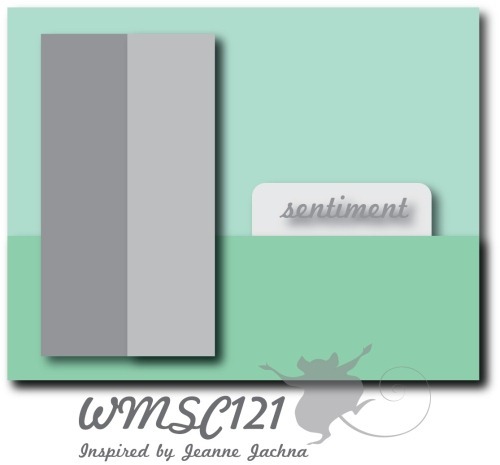 I created what I hope is a masculine card by selecting papers and stamps that are suited to a man. The yellow chevrons and the green star on a kraft base seems to work for me. This card could totally be made into a more feminine card by changing the ink used for the birthday tag. 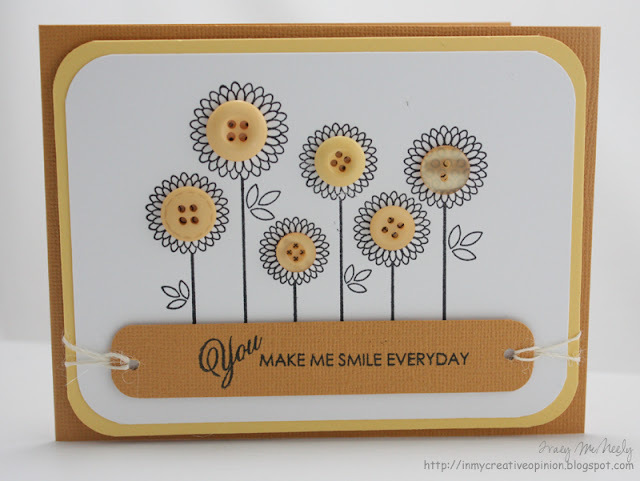 Dies: Limitless Layers 1 3/4"
This week Neat & Tangled is our sponsor and the design team is bringing you cards stamped with Neat & Tangled stamps. 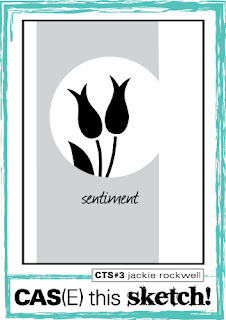 My card uses Sweet Home which is a delightful mix of images and sentiments. 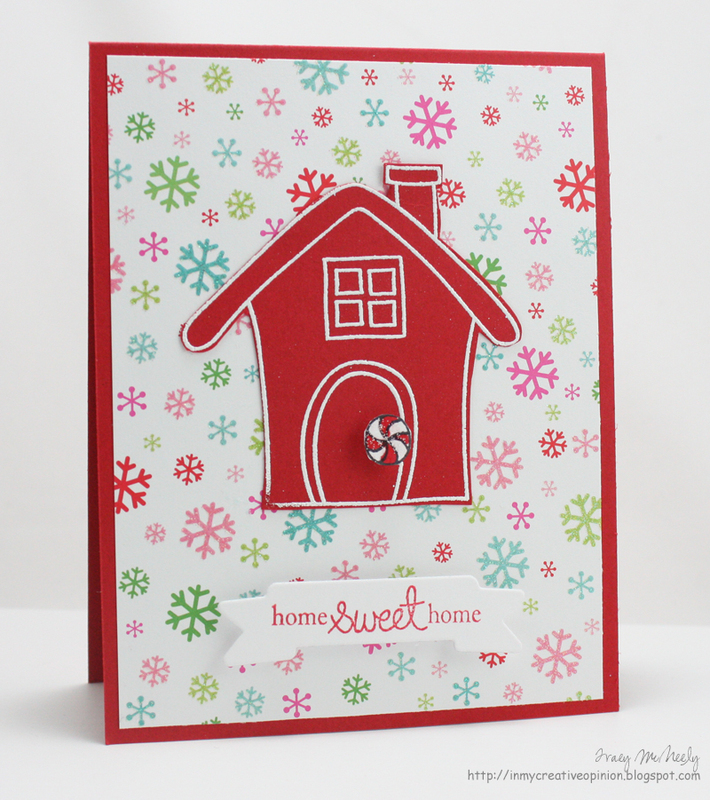 I stamped and embossed the large house in white on Pure Poppy cardstock. I fussy cut the image and mounted it onto fun glittery snowflake patterned paper from Doodlebug. I finished it off the house with a 'sweet' doorknob and finished it with the home sweet home sentiment. 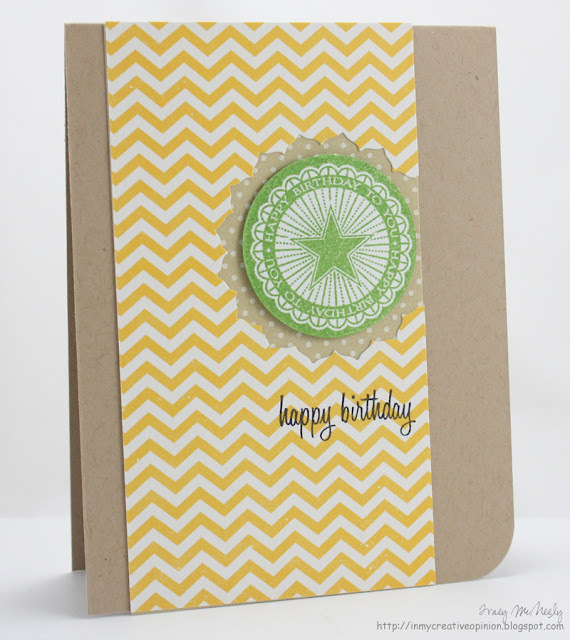 When you have a die cut or fussy cut image in a solid coloured cardstock you can mount it onto patterned paper without the two papers competing with each other. I can't wait to see what SUGAR means to you! 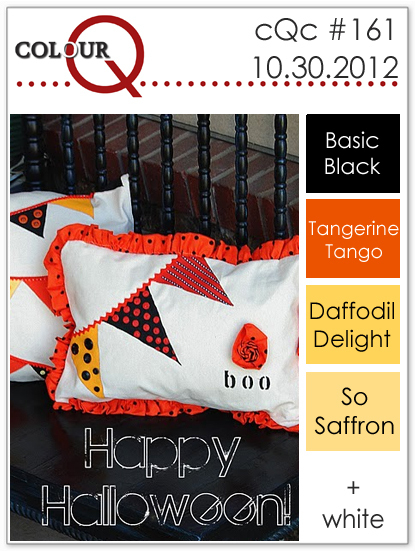 A perfect colourQ pallete for a fall birthday. 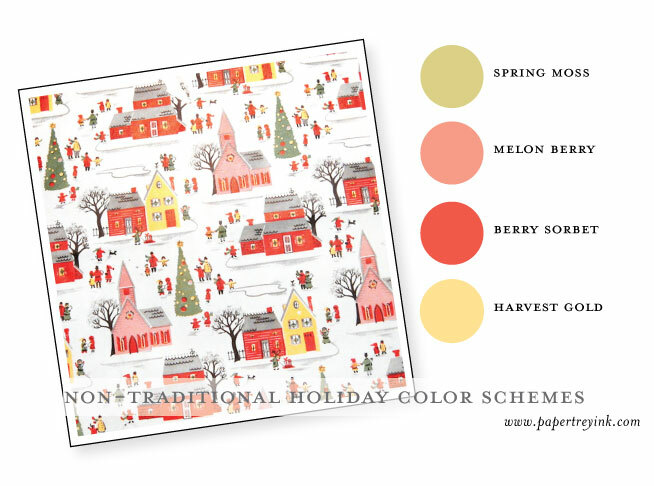 It was so fun to use three different autumn shades on my card for this week. Arielle is so good at picking colour combination that are just fabulous! I started with a white panel that i stamped my sentiment on first, followed by by a circle pattern stamped in Summer Sunrise. I die cut a doily in Orange Zest and added a flower created with Harvest Gold and Summer Sunrise then topped it with a harvest Gold button threaded with Orange baker's twine. This week's CASual Friday's Challenge is to use kraft is your project. What is not to love about kraft, it goes with everything. 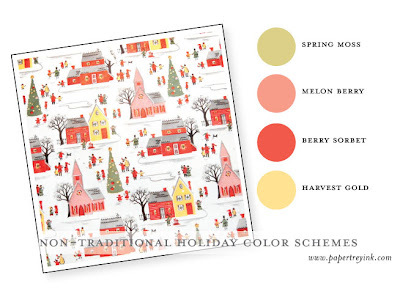 In my case I chose to combine kraft with red and Christmas. 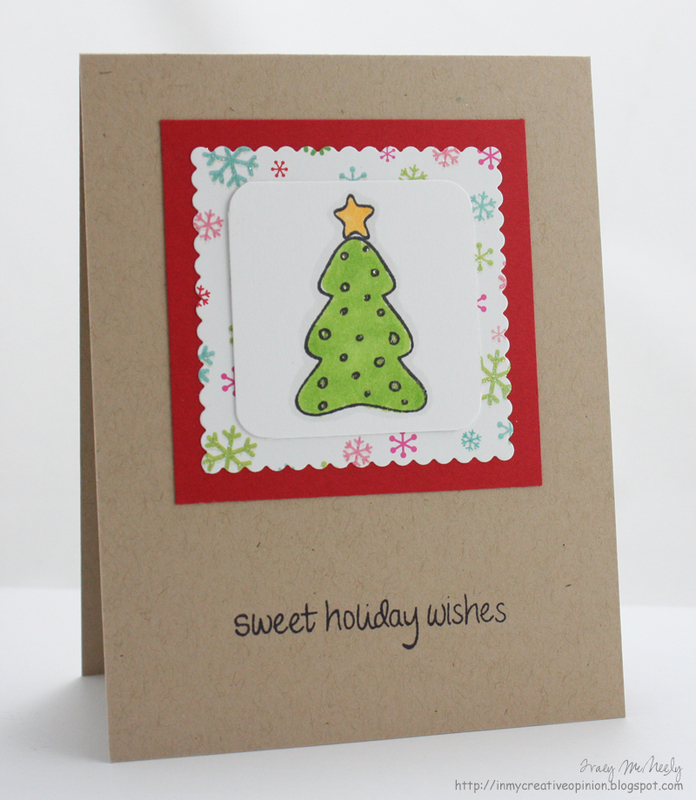 My card went together so quick and easy and it is a design I can keep on using for Christmas cards. 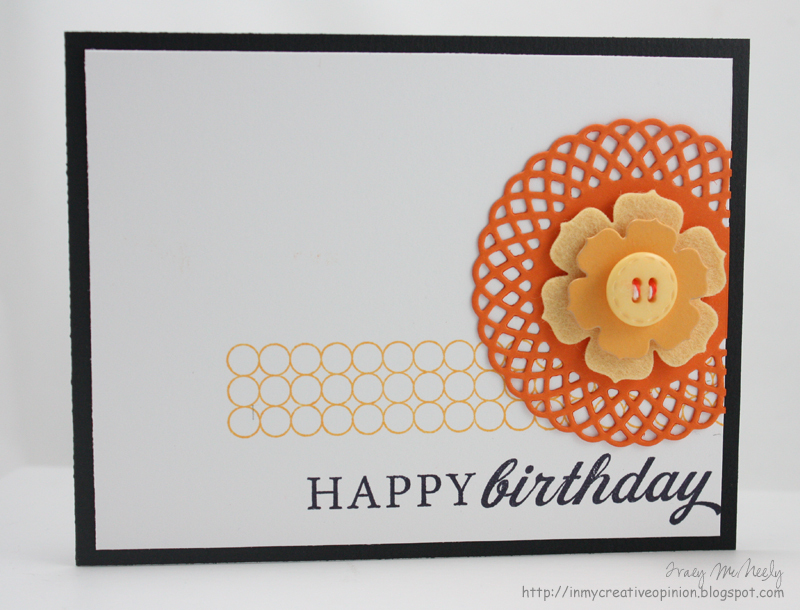 This was also an opportunity to use the Sweet Home stamp set from Neat & Tangled. I love Danielle's stamps the images stamp beautifully and the handwriting is so pretty. At the time of posting this I am hearing the high wind gusts against the house. Sandy should be arriving is these parts later tonight, not as a hurricane, but bringing lots of rain and high wind gusts. We are under an advisory from Environment Canada. Fingers crossed that the storm doesn't turn into snow. I hope that all my friends on the east coast are staying safe and dry this afternoon. 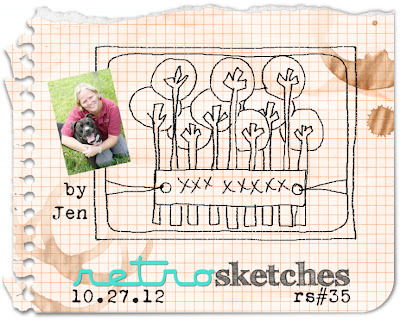 This week's RetroSketch is based on a sketch of THIS card from Laurie Wilson. 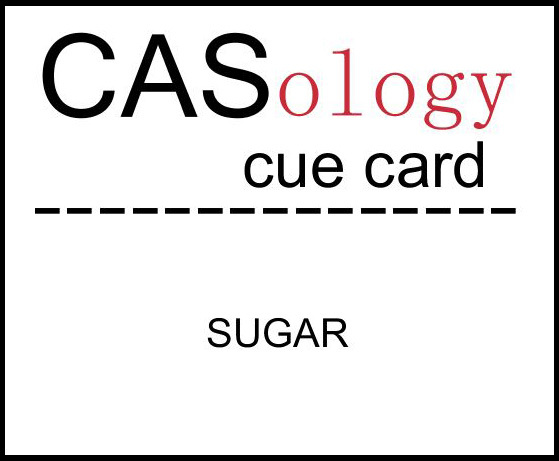 Laurie has an amazing talent to create the most fantastic CAS cards. I think I am starting to shift gears from Halloween to Christmas. 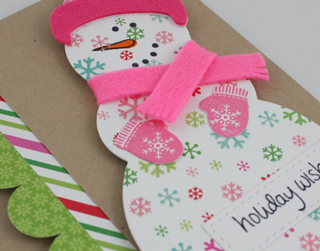 I pulled out my Shape Up Series Snowman die and stamps to create this card that I am not sure I will ever be able to part with. I created the snowman with Doodlebug Winter Wonderland glittery paper and some Hibiscus Burst and Raspberry Fizz felt from Papertrey. The snowman is popped up and so is the panel she is mounted on. To create frayed end on her scarf I snipped the ends with sharp scissors. Time for another attempt at the Waltzingmouse Sketch Challenge. I was so thrilled last week when my card was chosen for a Top Mouse Award along with Marybeth Lopez and Michelle Bala! 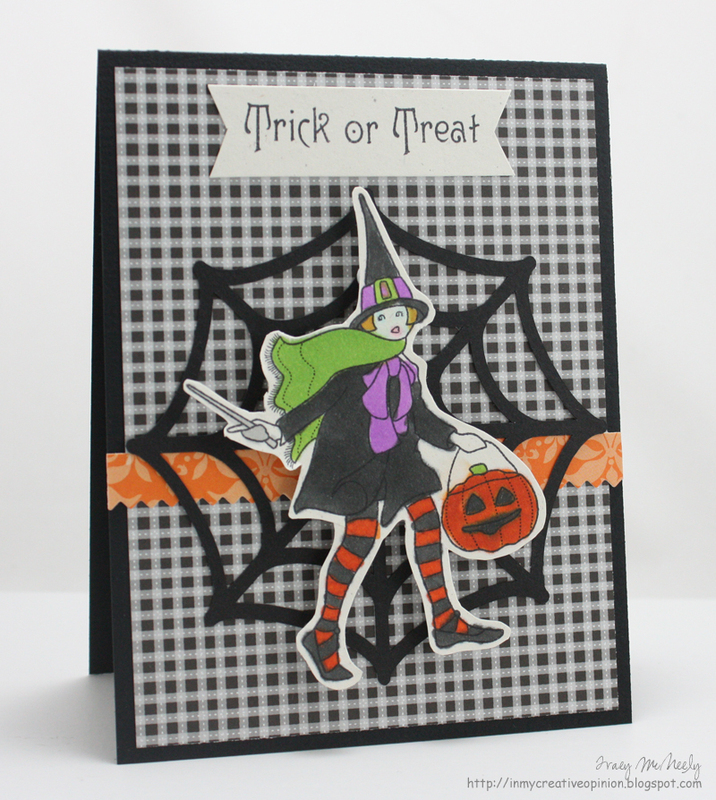 This week I created another Halloween card and brought in my Cameo to assist me with a spider web background. I can't colour, never could. They say that to develop creativity in children that you should let them colour outside the lines if they want, no problem for me! When I was little I wanted my colouring to look like my older sisters, so I would get her to colour it for me! She was 10 years older so of course her colouring was better. I am one of 5 children and my family to this day will tell you that I am the creative one. That may be true, but I still can't colour. So Cicely may not be perfect but I am sure this is the best fussy cutting I have ever done--all limbs are accounted for. 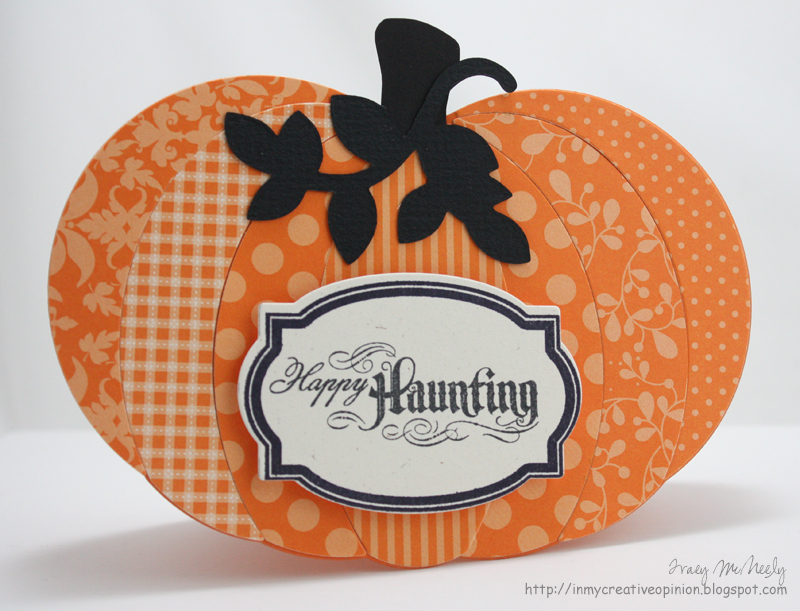 I am also submitting this card to the Cameo Spotlight Challenge #6 which is to create a project for Halloween using your Cameo. The spider web I had downloaded a long time ago but never used. 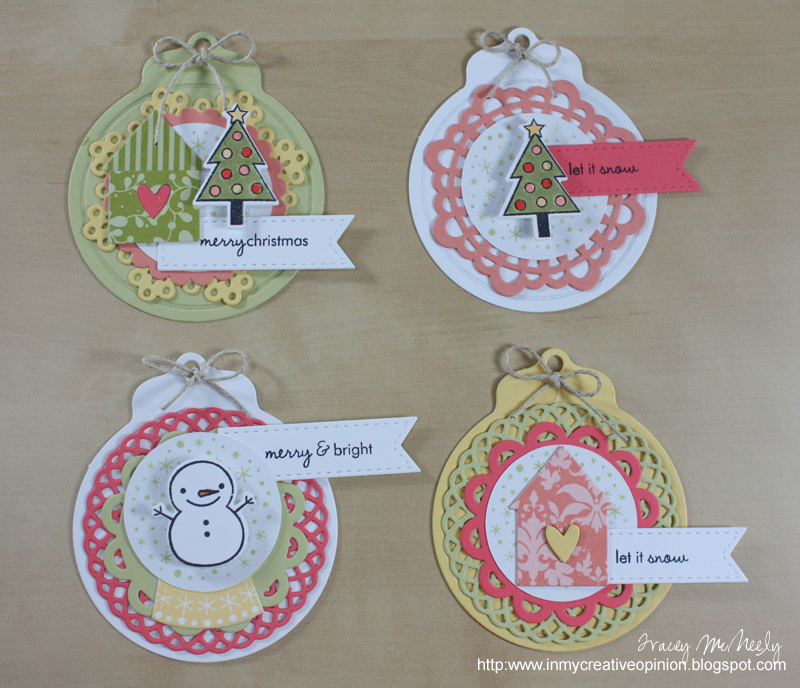 Love the way the Cameo cut the intricate designs. I am also linking this up to CAS-ual Fridays Over the Edge Challenge. 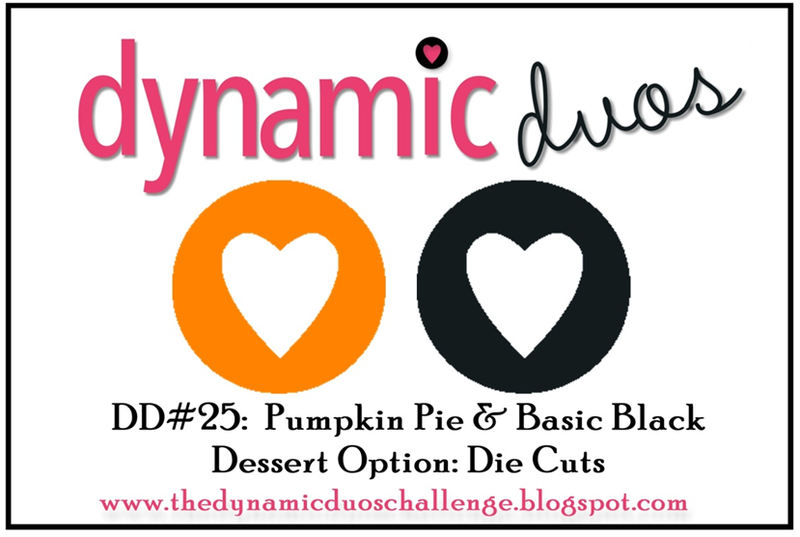 This week at Dynamic Duos they are having a fun challenge using Orange and Black just in time for Halloween. The dessert option this week is die cuts! I had die cut the Shape Up Series Pumpkin from Papertrey a when I first got the dies and never got to finishing it off. So the opportunity has come up with this challenge. I die cut the pumpkin two times and I scored a 1/2" from the top of the back and adhered it to the front to form a card. I find that the cardstock is too thick to use the die on folded paper. 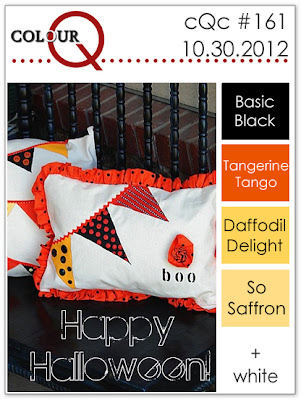 I then cut the pumpkin slices using all of the colours in the Orange Zest paper pack. I assembled the pumpkin, added a black stem and die cut a small branch also in black for the top. I then stamped and die cut the sentiment. One of the first things that jumped into my head for this weeks cue was a wild roller coaster. I love roller coasters even though I am petrified of heights. I die cut the roller coaster using my Cameo, I was actually surprised at how well it handled such a tiny and detailed image. It even handled die cutting each one of the teenie tiny cars individually. 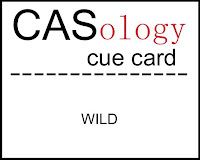 I can't wait to see what WILD means to you!